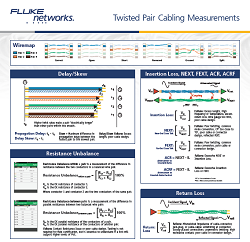 While twisted pair can be straightforward to install, measuring its performance can be somewhat more complex. There are more than a dozen different measurements you can make to a twisted pair cable. Learn about them all by ordering our 24” x 36” (61 x 91 cm) poster today! Note: This offer is limited to the United States and Canada. In other geographies, contact your local sales representative. Please allow 6 - 10 weeks for delivery.